I’m not sure if you remember us but we adopted Rocky from Austin Boxer Rescue in May. I wanted to update you on his progress. He is one of the sweetest, loveable, laid back boxers I know. He is getting along great with Daisy. They love each other very much! 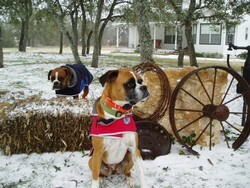 Both of them made the Fox 7 news during the ice storm! I have attached their picture for you to share with others.